Amazon is one of the leading companies in the world when talking about logistics. You just need to visit their website, find the product you need, buy it online and it will be delivered to your home within 2-3 days. And if you are a prime member, you just have to wait one day or even pay a little extra fee for same-day delivery. To do so, Amazon runs huge warehouses all over the world located at strategic places, so that distances between retailers and customers are minimized. Besides that, product picking is fully automated to speed up the consignment process. How ever, when it comes to fresh food, the tasks becomes more complicated. Fruits and vegetables as well as fresh meat, fish or dairy products require special storage and transport conditions to stay fresh and healthy. Strawberries for instance require a constant temperature of 4° celcius and additional low-oxygen atmosphere in order to stay fresh during a 3-4 days transport and storage period – requirements Amazon isn’t able to fulfill in its own distribution centers. Therefore the company created a new strategy for grocery. Instead of investing a lot of money in own warehouses, Amazon leases storage capacity in grocery warehouses that are located in regions they want to enroll their business. Products sold come from big retailers such as Taylor Farms etc. Cosidering the supply chain of grocery, Amazon enrolls its business only at the last step, but instead of competing in the traditional grocery stores market, the company creates a new business model by delivering food directly from the whole salers to the customers. The business model is as followed: After ordering online out of a catalogue of about 20.000 products, Amazon fresh delivers the ordered grocery either at the same day or the next morning. It therefore has its own fleet of small trucks. Each delivery costs 5$ when the total bill is below 35$. Orders bigger than 35$ are free. Alternatively, Amazon offers a one-year free delivery service, which costs 299$/year. A prime-account is necessary in both alternatives. Amazon started started in 2007 in Seattle, USA and since then expanded to Los Angeles and San Francisco (2013), San Diego, Philadelphia and New York (2014). In february 2016, Amazon announced to have signed a cooperation agreement with Morrison’s, UK’s number 4 grocery store. Further expansion to other countries is planned. An organization that dynamize the exchange relationships between the consumer and her own business. Provider: business. End user: consumer. Amazon support a seller create her own page on which she can list her products and serving consumers, although not directly. However, Amazon also offers its own products, both new and used, which consumers can purchase directly from Amazon. Source: Reproduced from <http://www.tutorialspoint.com/e_commerce/e_commerce_business_models.htm>. Accessed: 02/27/2016. Represent the exchange relationships between business. Provider: business. End user: business. The B2B ecommerce system provided by Amazon is addressed to all sizes of businesses, from SBA organizations to large enterprises. Specially manufacturers and distributors, professional sellers and vendors. Businesses can register for a Professional Selling Account or as a Vendor on Amazon. How to generate value in this process? 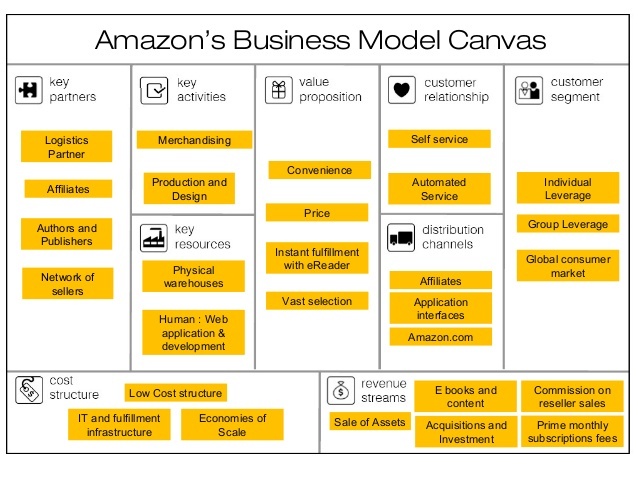 At the Amazon Business Model Canvas it is possible identify the significance of the logistics partners (own logistics, Fedex, UPS) and the network of sellers, as far as key partners. The physical warehouses distribution and the web application and development are key resources. In relation with the cost structure the low cost structure, IT and fulfillment infrastructure and the economies of scale are the pillars of this model. Source: Reproduced from <http://www.slideshare.net/dipikaasahoo/amazon-46025736>. Accessed: 02/27/2016. The concept of lean logistic come from lean manufacture (is a theory which looked to reduce and eliminate all the wastes during the process). This theory was integrated into the Supply chain as a concept that involves reduction process, eliminating inefficient costs, improved runtime, increased speed and flow of information and continuous improvement in the quality of services provided During all the process. Lean logistics is an ongoing challenge, especially reducing delivery times “Door to Door” when the distances are great, if it’s clear that there are many parties involved. There are a strong connection between LEAN and the culture of the “Six Sigma” because this takes advantage of the strengths and weaknesses of each discipline to create cultural and operational model that helps logistics´ managers to resolve issues that are complex by nature, while improving operations at all levels. Lean is a continuation of Six Sigma (TPM develop by toyota) culture which seeks to minimize the variations in the events that must happen in the process, while searching for the margin of error in the process always tends to zero. Logistics providers must always be clear about these customer we need to reduce inefficiencies and control variations in the processes we manage. First of all, it is shown a flow diagram for a book order of Amazon. This diagram describes the full process for a book order in Amazon (https://www.amazon.es/). As you can see, it is possible identify different improvement areas according with the information flow. For example, in this case it is possible identify the significance of the process of registration: (1) creating a new account o (2) register as a guest shopper (not available). Source: Reproduced from <https://mscott865.wordpress.com/2012/11/13/amazon-book-order-flow-chart/&gt;. Accessed: 02/25/2016. Secondly, the ABC analysis determines the relation between the factors A, B and C. Represent a hierarchical analysis in order to determine the priorisation around the different options. Category A: the category for items that are outstandingly important, or business critica. Category B: the classification for items of average or middling importance. Category C: the designation for relatively unimportant items. Important to weigh the relevance of the stock inventory. Related to Pareto 80-20. Source: Reproduced from <http://www.eazystock.com/blog/2015/07/10/how-does-abc-analysis-affect-inventory-optimization/&gt;. Accessed: 02/25/2016. Finally, in this picture it is possible identify the geographical distribution of Amazon in the United States. This representation allows analyze itineraries for an improvement proposal and get an overview of the company. Logistics is about time, this picture represent the vast organization that Amazon dynamizes (only et the United States). Source: Reproduced from <http://www.mwpvl.com/html/amazon_building_new_sortation_network.html&gt;. Accessed: 02/25/2016. The time in a company acquires a vital importance when there are many processes. The time is money invested in the workers, in the service or in the product, but we can spend this money in a profitable way or not. To understand the time of our process, there are three important visual techniques to plan the process: Gantt chart, Program Evaluation and Review Technique (PERT), and Critical Path Method (CPM). The three techniques mentioned before show the time taken by each component of a process. The Gantt chart is an intuitive method and easy to interpret, but it doesn’t establish the relationship between activities, however, the PERT and the CPM method do it. The CPM and PERT facilitate the critical path and the time which an activity can be lengthened without delaying the process. These techniques are closely related with the logistics of a company because they are used to plan, to implement, and to coordinate a business. These tools become more important in the process when there are bottlenecks, processes using the same equipment, various processes in the same plant or processes on demand (we need to know when the product will be ready), among others. If you want to learn more about these tools and how to use them there are more information in the links. You can read about the same day recovery in amazon in other post, but we want show the importance of innovation to increase the efficiency and effectiveness, for this we are going to compare the logistics center in San Fernando de Henares (Madrid) with the logistics center in Tracy, California. You can see the process in Madrid and the process in Tracy. This new technology makes us win: more space capacity, less time to prepare the order (times are down 90minutes to 15minutes), less tired workers that previously they had to work long distances (the stock amazon has the dimension of 59 fields football). Similarities: they continue using an ordered chaos and not classify objects by class. Technology used in both stores: first quality control (photograph, measure and weigh), product identification barcode and very important for my machine labeled (if labeling performs poorly, the package is not sent and the company loses money and image. Many small businesses lose money to make the wrong type labeling for not having this technology). Future technology: Sending by Drones, FAA, the federal agency responsible for regulating the airspace of the US, Amazon has given permission to use autonomous flying vehicles, although with many restrictions and an experimental license. Amazon hopes to deliver packages in less than 30 minutes, even in rural or difficult to access. This week I had to prepare the El Corte Ingles case, so looking for information about this corporate I found an interesting article about an innovating services that El Corte Ingles launched past 15th of December. This services is called ¨2 Hours Delivery¨and as the article sais it´s about the delivery in just two hours for a large number of items of different categories. The customer can choose, when he makes his purchase through the web http://www.elcorteingles.es, the possibility of receiving the goods within two hours at his home. The website itself tells the user which products may receive in that period of time, depending on the place of delivery and the stock available at the time. I think it´s a huge leap in the market , nowdays time it´s very important and everybody wants to have everthing you want NOW or or at least as soon as possible . They go directly to the ¨problem¨….if you are looking for an urgent gift or a urgent solution …they have the clue ! It can be a big problem for competitors , it´s quite dificult to compete with this. Only with a lot of resources you can sustain such a service.